The MELPe codec can transcode its bitstream directly to another rate. Suitable for band limited or efficiency limited communication systems such as satellite links and military applications. The demonstration uses a STMicro STM32F407 Discovery board configured to run MELPe Encode/Decode. G711 is provided for comparison purpose. 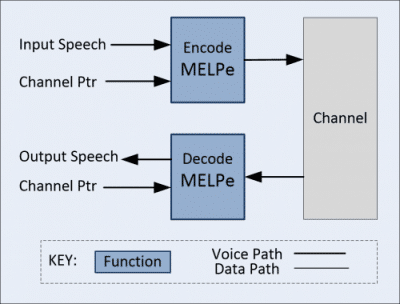 MELPe (Multi-Excited-Linear-Prediction enhanced) is an optimized voice compression codec suitable for low bit-rate communication systems such as satellite links, VoIP, and military applications. Sampled at 8 kHz, MELPE achieves this by compressing digital speech to 2400 bps, 1200 bps or 600 bps. MELP originally developed for and standardized by the U.S. Department of Defense (DoD) as MIL-STD-3005 in 1997 and superseded LPC-10 as the low bit rate DOD standard. Furthering the codec’s development, enhancements were incorporated into the MELP standard. As a result MELPe (Enhanced MELP (Multi-Excited-Linear-Prediction) was adopted in 2001 as the new standard. MELPe incorporates lower bit rates (1200 bps, and 600 bps) and includes a noise preprocessor (NPP) which is intended to reduce many types of background noise. Additionally MELPe’s decoder incorporates a postfilter to improve voice quality. MELPe was standardized across NATO platforms (STANAG 4591) in 2002. DOD’s primary goal was to develop a digitally narrowband codec that could perform well in adversarial jamming conditions. Adaptive Digital’s highly optimized MELPe voice compression codec supports the following platforms: Texas Instruments’ TMS320C6000, TMS320C5000 | Arm Architectures (v5, v6, v7-A/R, Armv7E-M, Armv8-A, Armv8-R) | Linux 32-bit/64-bit | Windows x86 / x64 | iOS | Android. 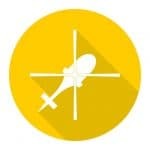 Adaptive Digital has optimized MELPe to run on the Xilinx MicroBlaze™ Soft Processor Core. A first in the industry, Adaptive Digital is opening new doors by giving our clients the opportunity to consider FPGAs as platforms for the codec requirements. The MELPe voice channel is show in the block diagram above. ADT MELPe is available on the above Platforms: Other configurations are available upon request. All Memory usage is given in units of 16-bit word. *Contact sales for 64-bit specifications. The MELP Vocoder uses a mixed-excitation model that can produce more natural sounding speech because it can represent a richer ensemble of possible speech characteristics. The MELPe enhanced speech coders’ quality surpasses that of the original MELP vocoder. The MELPe software is capable of running multi streams (multi-channel) together, either encoding and decoding concurrently. The MELPe codec supports three different vocoder bitrates: 2400, 1200, and 600 bps. The basic 2400 bps bitrate vocoder uses a 22.5 ms frame of speech consisting of 180 8000-Hz, 16-bit speech samples. The 1200 and 600 bps bitrate vocoders each use three and four 22.5 ms frames of speech, respectively. These reduced-bitrate vocoders internally use multiple 2400 bps parameter sets with further processing to strategically remove redundancy. The payload sizes for each of the bitrates are 54, 81, and 54 bits for the 2400, 1200, and 600 bps frames, respectively. The MELPe algorithm distinguishes between voiced and unvoiced speech and encodes each differently. Unvoiced speech can be coded with fewer information bits for the same quality. Commercial applications have arisen because of the low-bitrate property of MELPe with its (relatively) high intelligibility. Because of this, MELPe is being used in a variety of wired and radio communications systems.